Known for her ‘sophisticated sound spectrum’ and ‘enthralling performance’ (Darmstädter Echo) Diane Hunger is recognized internationally and performs frequently as soloist and chamber musician throughout Europe and the United States. Recently she could be heard as soloist with the Hamburger Symphoniker (Germany)(D. Milhaud: Scaramouche and H. Villa-Lobos: Fantasia) and the Filarmonica Banatul (Romania premiere of the saxophone concerto by Kalevi Aho). Furthermore, she gave the world premiere of a new saxophone quartet by Swedish composer Mika Pelo at the World Saxophone Congress in France and the US-premiere of the quartet concerto by Sally Beamish together with the Lubbock Symphony in Texas at the national conference of the North American Saxophone Alliance. In February 2016 Diane played the world premiere of the chamber concerto for alto saxophone ‘Remembering the Night Sky’ by Stephen Ferre in Syracuse, NY. Highlights in the past have included a solo performance in Carnegie Hall, two residencies at the National Music Festival in Maryland, as well as tours in America, France, Scotland, Holland, Germany, Poland, and Spain, as well as master classes at several American universities. Diane was broadcasted nationally through NPR’s Performance Today, interviewed by the Northern German Radio (NDR) and the newspaper Kieler Nachrichten (Germany), and has recorded for the Bavarian Broadcast Station, Carl Fisher Publications, and Mark’s Records, where Mana Quartet’s CD ‘Vide Supra’ is published. ‘Vide Supra’ was just nominated by the Grammy committee as Grammy Nomination eligible. Not only dedicated to inspiring dynamic new works for saxophones, Diane is also enthusiastic to rediscover music from the past and frequently transcribes music for saxophones. Recent projects include Dvorak’s Terzetto Op. 74 and Libby Larsen’s Yellow Jersey, which was published by Oxford University Press in 2014. 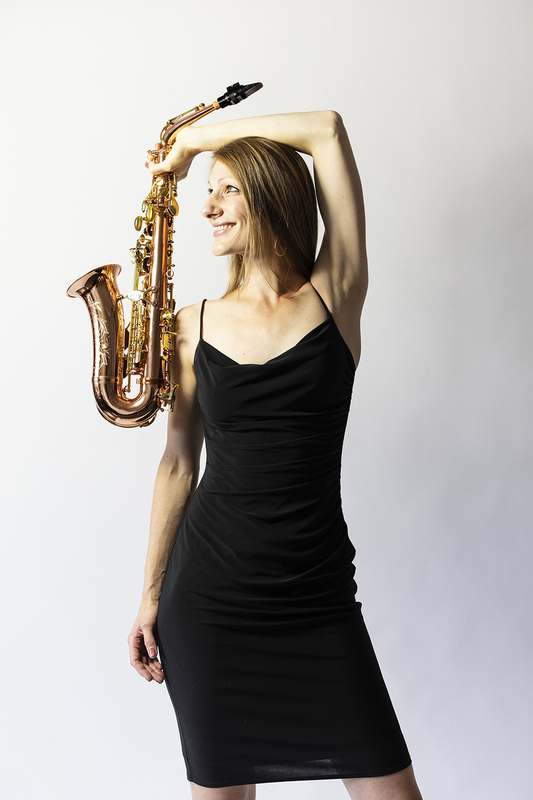 Furthermore, Diane is interested in extending the repertoire for saxophone and frequently works together with composer such as Kalevi Aho, Violeta Dinescu, Michael Lanci, Amos Gillespie, and Mika Pelo on new, exciting works for the saxophone. Diane Hunger comes from a musical family: her Great-Grandfather was concertmaster with the Dresden Philharmonic and her Great-Grandmother a concert pianist, and Diane has made music from a young age. She is a native of Germany and currently resides in Buffalo, NY, from where she starts her international tours as soloist and chamber musician. Diane holds the tenor chair in the critically acclaimed Mana Quartet, is a member of the Duo Klang par2, and teaches saxophone at Syracuse University, as well as the State University of New York at Fredonia. Previously she taught i.e. at Cornell University, Roberts-Wesleyan College, Canisius College, and as Teaching Assistant at The Eastman School of Music. Diane received a Diplom-Saxophonlehrer with excellence from the Musikhochschule Frankfurt/Darmstadt in 2008, a Masters in Performance from Fredonia in 2009, and a Doctorate of Musical Arts in Saxophone Performance with a Minor in Music Business, as well as an Arts Leadership Certificate from The Eastman School of Music in 2014. While at Eastman Diane was awarded the prestigious Performer’s Certificate, and won the 2011 Eastman Concerto Competition playing Frank Martin’s Ballade. In 2012 she won the American Protégé International Competition. During her undergraduate degree Diane was the only elected instrumentalist to perform a concerto with the Darmstadt Akademie Orchestra in 2007, and was a national price winner in the German competition Jugend musiziert in 2003. Diane Hunger is a D’Addario Performing Artist, performing on Reserve Reeds exclusively.